Last month, we brought you the story of a Kansas City, Missouri-area pizzeria that claimed it had created “Kansas City-style pizza.” I expressed skepticism that its sauce-on-top and herb-butter-brushed crust were enough to create a new geographic style of pizza. Put scientifically, I was unsure Pizza Speciation had occurred. To truly join the ranks of accepted regional pizza styles like Detroit, New Haven, New York, or Chicago, I wrote, Kansas City-style pizza should perhaps be slathered in barbecue sauce or topped with burnt ends. Now, two pizzerias are doing just that. I’m not taking credit… except I’m 100 percent taking credit. Beautiful. But other pizzerias are also heeding my call, and today I caught wind that Kansas City’s Minsky’s Pizzeria had teamed up with that most KC of institutions, Joe’s Kansas City Bar-B-Que, to offer a special barbecue pie at all its locations beginning March 25. 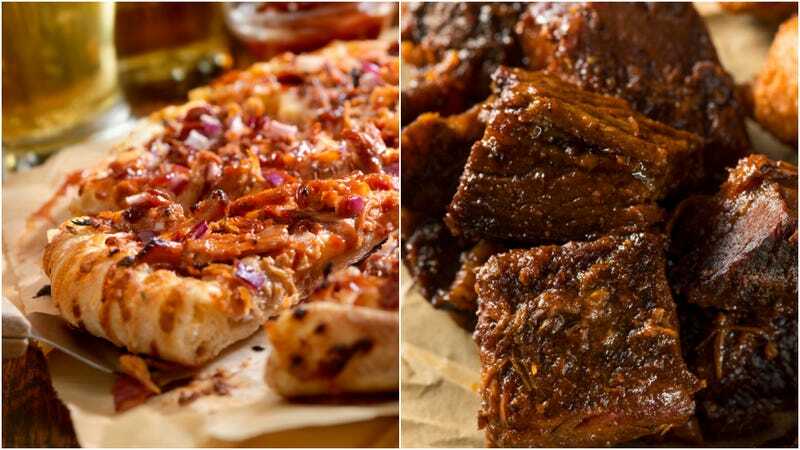 The pizza will be topped with smoked brisket, pulled pork and burnt ends from Joe’s, Joe’s KC BBQ sauce, and dusted with Joe’s fry seasoning—just like I’d hoped and dreamed.